Believe me, on my first session I already felt a big relief, for the first time I was able to sleep well. I highly recommend BCC! So please I encourage all those who are suffering to call BCC and book an appointment.” A.
I wasn’t sleeping, my neck was seized up, it took a long time to ease it- that was because I had never heard of a Chiropractor. I wish I had gone to one sooner-they are brilliant-in fact I cannot thank them enough.” E.D. Headaches caused by shoulder and back problems have been considerably eased by regular visits to the Chiropractor. Alicia is friendly and very thorough.” I.S. “My husband first came to the Chiropractor and when I saw the difference it made to him, it made me see if they could do anything for me. I have only been coming for a few weeks and already i can feel the difference in my neck and shoulders and the top of my legs. I only wish I had done it years ago instead of putting up with the pain.” J.M. ” I have had a lot of pain in my neck for many years. No other treatment had got rid of my discomfort until I visited Alicia. I have gone 3 months without treatment and without pain. Been visiting for the last 12 months.” S.E. ” I couldn’t move my neck up, down, left, right.Turning over in bed involved 17 point turn and grabbing hold of the mattress. Now I am virtually pain free and have greater mobility. Wendy has treated parts I didn’t know were malfunctioning and as a result I don’t hunch when walking. Professional, friendly and it works.” V.T. “Before coming to see Alicia I was constantly suffering for back and neck pain. I had tried other treatments but nothing seemed to improve much. 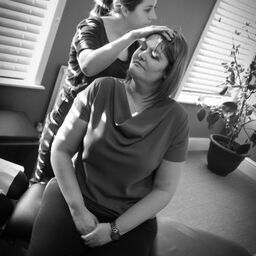 I now feel much better with the treatments I have received from Alicia, my back and neck have really strengthened up and improved which is fantastic. I would definitely recommend seeing Alicia to anyone-all the staff are very friendly, very helpful.” H.S. “Been coming for treatment for some time, I had a bad back and neck. Feel so much better now and my regular top up keeps me feeling good. Thanks for everything.” P.R.